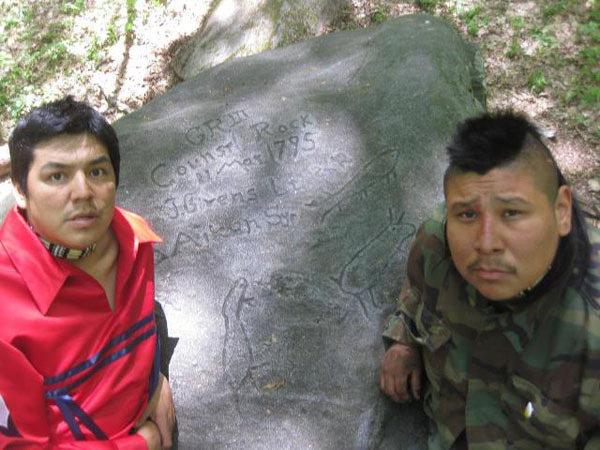 Right: Johnny Hawke, Left: Richard Peters in the Reposed Traditional Gathering Place known as Council Rock and Oshkimaadizing Unity Camp. The Camp has been set up to establish Tradiitonal Anishinabek Clan Governance and to organize AnishinabeK Peoples and communities who want to reorganize and assert thier Soveriegnty opting out of illegally enforced colonial policies and laws. – Chippewa’s of Lake Huron and Simcoe; Hereditary Chief Yellowhead May 1798 Addressing Superintendent of Indian Affairs of Upper Canada Russell Peters. Land Claim Settlements between Colonial Settler States and Anishinabek Nations of Turtle Island are being resolved more and more each day using biased colonial policies where these Settler States are the judge and jury of their own crimes. The policies used to settle these Land Claims reflect the same injustices that are in these Claims and where we are in the same position our ancestors were in however the only difference now is that we can read and write in the colonial ways understanding what we are truly signing away and Surrendering to. There are two types of Aboriginal claims in Canada that are commonly referred to as “land claims”: comprehensive claims and specific claims. Comprehensive claims which are also called modern treaties are always about rights to land. The Specific Claims Policy is a policy that deals with a majority of our grievances allowing our Nations to purchase private lands back from private land owners on a willing seller and willing buyer basis using financial compensation. Financial compensation most times is also distributed per capita to “Band Members” and any remaining dollars usually is not enough to acquire the same amount of lands that were stolen. Why should we have to purchase our own territories that were stolen? When I say ours I mean ours. I acknowledge our teachings that we are of the Earth and do not own the Earth but I also include my belief that these lands are our territory. Just as a bear belongs to its natural territory, we have our natural original habitat. With the theft of our lands this allowed for the imposition of colonial policies that suppressed our own form of governing ourselves as the Sovereign Nations we are. In these Land Claim Settlements there is no relinquishing of these foreign laws such as the Indian Act and their Judicial System that are imposed on our Nations. Our Nations of Turtle Island have Intertribal Agreements where my Nation along with many others around the Great Lakes agreed to the One Dish with One Spoon Wampum Belt. This Agreement establishes a peace and co-existence and acknowledgement of each Nations right to their area, territory or “natural habitat.” We know we don’t own the Earth and never colonized each other for territory. We made this agreement because what happens to one Nations Territory affects the others. This Agreement was forgotten as individual groups started to cede away their own territories with the Settler Nations without first sitting down and counseling with the many Nations involved in this agreement. Many Land Surrenders are invalid because of this Agreement has not been enforced. The 1764 Treaty of Fort Niagara is an Agreement where our Nations established an alliance with the British Crown where the Canadian State is its current Representative. In this Agreement the Crown offered us the Western Great Lakes Covenant Chain Confederacy Belt and The Twenty Four Nations Belt where we as those Twenty Four Indigenous Nations accepted and exchanged with the Crown the Two Row Wampum Belt. By agreeing to this our Nations and the Crown accepted a nation-to-nation relationship rooted in a policy of peace, non-interference and coexistence. When the Crown breaches this Agreement which ultimately legitimizes their presence on this Continent every one of their laws and legitimacy as their own Nation is therefore invalid. If we as Anishinabek Nations believe one does not sell or own the Earth and at the same time believe that we need to walk in both a mainstream and an Anishinabek world how do we then manage to walk our talk when we except all the benefits of selling our share of the Earth to remain surviving in our comfortable mainstream consumerist capitalist world expecting to distinguish ourselves as a distinct Nation with a belief system that connects us to the Earth? I often hear Elders and Spiritualists in my circles legitimatize the selling of our Territories using the illusion that we have to walk in two worlds. Colonization and Christianity has infiltrated and pacified our belief system where a new age spiritualist pan Indian traditionalism ideology has been created. This has helped to establish a superficial aspect of our culture, the essence and vitality of the culture itself is lost or minimized this is evident through powwow and the influence of Christianity on our belief systems which also created a Non Violence value in asserting who we are which keeps us submissive to colonial authorities. Even some of our Nation’s Hereditary Chiefs who were representing Indigenous Sovereignty in the past generations sold the Earth for a price disregarding our original instructions and teachings that are our Way of Life. My Community has accepted $307 Million Settlement surrendering our Traditional Territories. I along with my brother opted out of this illegal process and have repossessed a traditional gathering place which now sits in a provincial park which is a place interwoven in the Six Nations and Ojibway Friendship Belt. A Nation is not a Nation without a connection to the Earth and a Territory to feed its own people. Like a Bear I will die fighting to protect my territory and Way of Life. No Surrender! Woliwon for your words and your truth. You are right my Warrior Brother, do not stand down in your beliefs, culture and traditions. windigokaan? does this mean that everything written above is to be taken as the opposite to arrive at your true meaning? who is walking in 2 worlds?